The first American art colonies appeared during the 1880s, when young artists, fresh from their experiences in France and Germany, began to return to America. These young Americans were a generation that returned to America carrying the most advanced ideas of European art. The early art colonies fed the spirits of these young artists and were located in rural settings that recreated the environments they had known during their student days in Europe. Robert Henri was born Robert Cozad in a small town in Nebraska. His family moved to Atlantic City to escape retribution from a situation in which Robert’s father had killed a man in self-defense. In 1886 Henri enrolled in classes at the Pennsylvania Academy and began training with Thomas Anshutz and James B. Kelly. He traveled to Paris (on his second visit he was influenced by techniques of impressionism), and taught in Pennsylvania and in Avalon, New Jersey. At the Avalon Summer Assembly in the summer of 1893 he taught a plein air class on the beach and private sessions three afternoons a week. Anshutz was considered one of the most influential instructors of his generation. In the fall of 1893, after teaching at the Pennsylvania Academy of Fine Arts for eleven years and traveling to Paris, Anshutz purchased a summer house in Holly Beach, New Jersey. 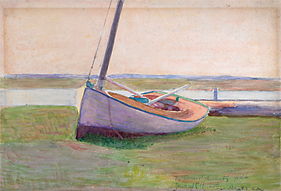 From 1894 to about 1900 he produced many small watercolors of the shore, including scenes of women, fishermen, children, boats, and landscapes. These scenes are considered among his best works ever produced, demonstrating a mature artistic vision. The light and atmosphere of the Jersey Shore, which stretches from Sandy Hook in the north to Cape May in the south, had attracted artists such as John Frederick Kensett in the 1850s and Winslow Homer a decade later. In the 1880s artist Carrie Cook Sanborn taught classes in landscape painting during the summers at her home in Point Pleasant along the Manasquan River, a short distance from the ocean. By 1894, Theodore Robinson, one of the most important first-generation American Impressionists and a friend of Cook’s, began to teach the instruction classes. The Manasquan River provided a strong inspiration for Robinson. His Boats at a Landing and Drawbridge - Long Branch - R.R. were both produced in a simplified style not seen in his work before. He organized the paintings into broad horizontal bands of color and omitted the usual laws of western perspective in favor of the Japanese technique of stacking the elements of the landscape. The previous year, in 1893, Edward Boulton, a close friend and collaborator with Thomas Eakins, ended his stewardship of the Art Students League of Philadelphia where Eakins taught, and moved to Point Pleasant where he bought a home and remained a resident there until his death in 1927. 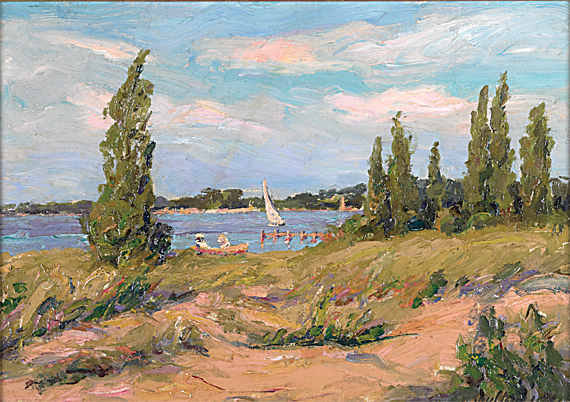 Albert Grantley Reinhart and his friend Charles Freeman began to visit Spring Lake, Point Pleasant, and Brielle, after having established their friendship when both were students in Munich, working with Frank Duveneck in the late 1870s and early 1880s. Both eventually took up residence in Brielle, New Jersey, on the Manasquan River, around the turn of the century. These artists sought one another’s company in the small villages along the Manasquan River. Other colonies formed on the Toms River in Island Heights and Holly Beach where Thomas Anshutz produced an important series of experimental, impressionist watercolors between 1893 and 1900. Most of the artists were peripatetic, staying at the shore for varying amounts of time — from a few months, like Theodore Robinson, to several years, like Thomas Anshutz. They all shared the belief that the New Jersey Shore was a place where their art would evolve and grow. 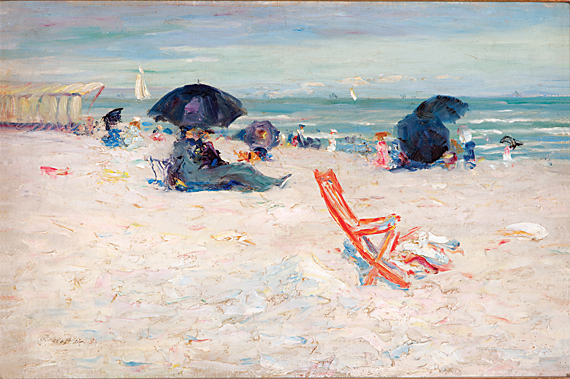 Grandin grew up and resided in Clinton, New Jersey, and spent the summers as a child and adult at the shore, where she did much of her painting. In 1906 Grandin began a long and close friendship with Robert Henri, first painting with him in Spain in 1910. In 1911 she went to Paris and for the next two years worked as a member of the Academie Moderne, learning Cezanne’s method of modeling form through color. Returning to the States at the beginning of World War I she studied etching with John Sloan in New York and in 1914 was asked by Henri to form an exhibition group for the McDowell Club on 55th Street, which became a celebrated annual event. Grandin was only one of ten female artists to exhibit at the landmark exhibition of modern art created by Walt Kuhn, held at the Penguin on East 15th Street in 1918, and in 1925, with twelve other women, she formed the New York Society of Women Artists. Grandin continued to help other women artists be recognized and was one of the pioneering women artists of the twentieth century. Her own paintings contain both the immediacy of the quick sketch and the expressive use of color used by the French Post Impressionists with whom she studied. The second generation of painters arrived after 1900. For the most part, they did not go to Europe to study, instead they sought instruction in the American art schools staffed by those earlier artists who studied in Europe. These artists often received their training at the Pennsylvania Academy of the Fine Arts, the Art Students League, or Pratt Institute. This second generation joined the existing colonies or formed new ones. 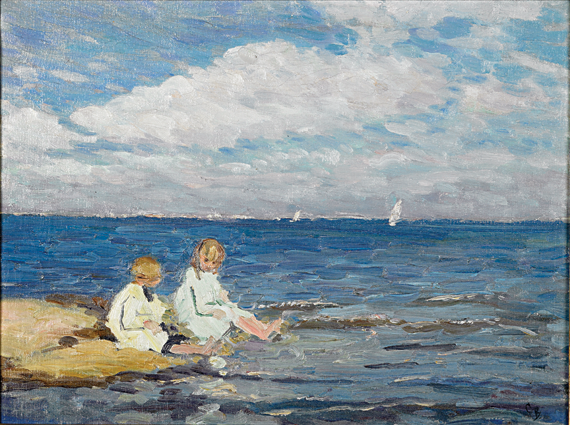 They produced works that focused on the natural beauty of the environment and the activities of the shore, such as swimming, boating, sun bathing, and the hard labor surrounding pound fishing. The core of the group was comprised of Albert Hencke, Ella Mendenhall Churchman, Oscar Julius, Edgar Pearce, Julius Golz, and Ida and Clara Stroud. All were accomplished, professional painters of considerable talent. Clara Stroud and Ella Churchman, the niece of the illustrator and influential teacher, Howard Pyle, exhibited frequently at the Society of Independent Artists; Julius Golz was the former Director of the Columbus School of Art. Among the idiosyncrasies that made the New Jersey Impressionists different from other colonies was the diversity of their sophisticated backgrounds. From the realism of Thomas Eakins, who frequented the shore and whose influence is found in the early work of Edward Boulton; the ideas of French impressionism, as seen in the work of Theodore Robinson, Claude Monet’s closest America friend; and the German technique of expressive brushwork seen in the early work of John Twachtman and in the work of his friends Albert Grantley Reinhart and Charles Freeman, all former students in Munich and of Frank Duveneck in nearby Poling. Another characteristic that distinguishes this community from others is the role of women artists. At a time when women were often discouraged in their pursuit of artistic training, there was an abundance of strong independent women painters: Caroline Coventry Haynes, founder and one of the first presidents of the National Association of Women Painters and Sculptors, Caroline Cook Sanborn, noted above, and Ida Wells Stroud and her daughter Clara Stroud, who worked to transform the newly formed evening sketch classes held in Newark into a robust and popular full-time art school. Ida is also celebrated for creating the first opportunity for New Jersey women to exhibit together in 1914. The artistry of Mildred Miller presents a very powerful and personal point of view that won her important national recognition for her Jersey Shore paintings. Lastly, what distinguishes the work of these Jersey Shore Impressionists is the quality of light present along the shore, which is unlike that of anywhere else. These artists shared with other art colonies many of the same founding conditions and, as a group, offered a body of work unlike that of any other. Edward Boulton purchased his house in Point Pleasant, New Jersey, in 1893. His friend, teacher, and collaborator Thomas Eakins frequently visited during the summers and they were both involved in the formation of the Art Students League of Philadelphia, where Boulton was president and Eakins taught. Boulton painted in communities along the shore for more than thirty-four years, rendering his images in an expressive manner of American Impressionism. Buergerniss first came to Island Heights, New Jersey, with his wife, Ella, in the summer of 1906 or 1907. The artist worked in oils, watercolors, pen and ink, and pastels. His works have the freshness and spontaneity of being painted out of doors. His favorite setting was in the Goose Creek area near Barnegat Bay, where he would take his family for picnics while he painted the bay and farmlands of rural Ocean County. The Depression was financially devastating and though he participated in the WPA the resulting income was not enough to sustain his artistic endeavors. By the early 1930s he gave up painting to become a piano teacher. Though few people remembered his earlier career, of the more than one hundred artists who made their homes or summered at Island Heights, Buergerniss was among the very best. Ida Wells was born in New Orleans in 1869. In 1888 she married George Stroud and in 1890 gave birth to their daughter, Clara Stroud. Through their lives, Ida and Clara created a distinguished body of work spanning more than sixty years. Ida’s early experiences in New Orleans were tied to events that inspired and liberated women from traditional roles and her decision to become an artist and her forays into woodcarving, pottery, and design have their origins in the place of her birth. In 1898 Ida studied with William Merritt Chase at the Art Students League, enrolled at Pratt in 1900 and later taught there from 1905 to 1907. Clara also graduated from Pratt, having studied with Arthur Wesley Dow. Ida spent most of her adult life painting and teaching at the Newark School of Fine and Industrial Art until 1943 (the school continued until the 1960s). Clara and her husband purchased a house in Bricktown, where Ida taught summer classes on the property. By 1930 Clara had stopped working in oils and committed herself to watercolors. Both were very involved in teaching and educating artists and in arts organizations and exhibitions, each earning frequent prizes and awards in recognition of their accomplishments. 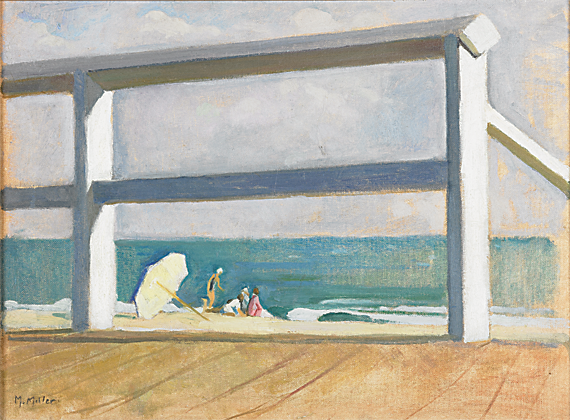 By the 1920s Miller’s work was widely exhibited at venues including the National Academy, Corcoran, Carnegie Institute, and Kresge Gallery. In early 1930, forty of her paintings were shown in a one-woman exhibition at the Arts Club in Washington. Miller gained a love of the sea from when she and her family spent their summers in Atlantic City, New Jersey. 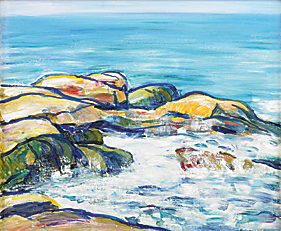 The shore became a source of inspiration in her art. During the summers of the 1930s she rented quarters in Cape May with her brother and his family. It was during these times when she produced many of the shore scenes that won her consistent praise and prizes. The accolades, exhibitions, and honors continued throughout her career. Roy Pedersen, is an art dealer and historian in Lambertville, New Jersey. He has lectured and written on the topics of modern painting and in recent years has focused on the history of New Jersey painting.